Then he kept digging the hole, with a BIG shovel. 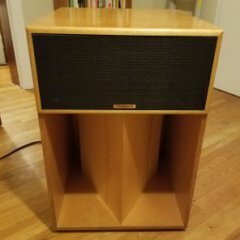 Also on the block are a pair of ALK jr crossovers, photo on page 1 of the “August battle of the amps” thread, barely used three hours, $325. Bump because it took me too long to find this thread after someone asked me about an item. This crossover allows for direct drop-in use with Khorns. And use from one multichannel amp, or three, four, five or six Stereo/mono amps. Bump for the price changes, and the added gear. The Pioneer D23 electronic crossover is the bomb for playing with new drivers and being able to change crossover slopes and adjust volume levels while holding a cuppa joe in the other hand. Outside of the newfangled computer controlled rack drive units, you will not find anything more flexible, and nothing compares in quality. Crazy how much gear you have Dave! St. Louis has been a hotbed for Stereophiles since post WWII, and both of my main mentors knew tons of people. Now I just have to work on passing on some of the museum, so others can enjoy it as much as we have. I am interested in the Cornet, perhaps I could take a look at it later this week.